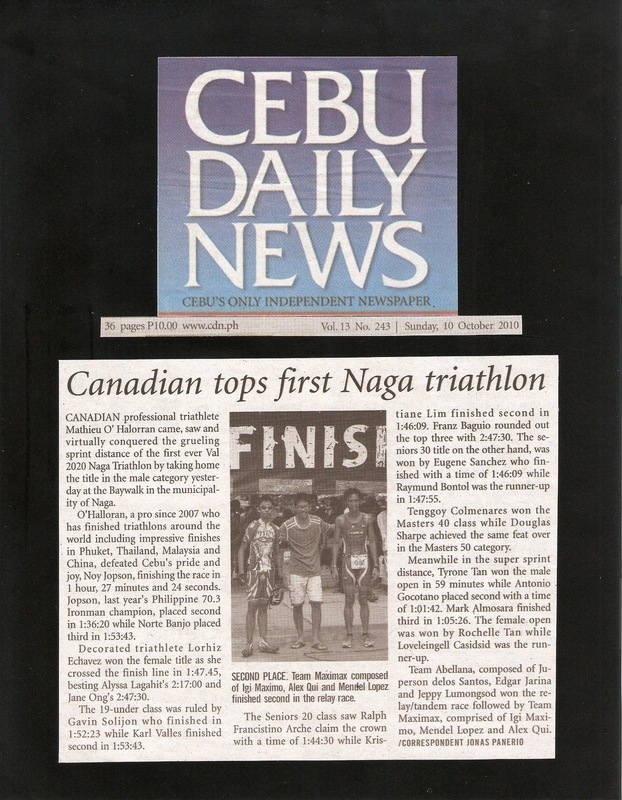 CANADIAN professional triathlete Mathieu O' Halorran came, saw and virtually conquered the grueling sprint distance of the first ever Val 2020 Naga Triathlon by taking home the title in the male category yesterday at the Baywalk in the municipality of Naga. O'Halloran, a pro since 2007 who has finished triathlons around the world including impressive finishes in Phuket, Thailand, Malaysia and China, defeated Cebu's pride and joy, Noy Jopson, finishing the race in 1 hour, 27 minutes and 24 seconds. 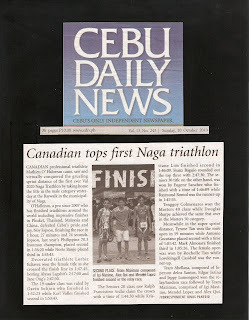 Jopson, last year's Philippine 70.3 Ironman champion, placed second in 1:36:20 while Norte Banjo placed third in 1:53:43. Decorated triathlete Lorhiz Echavez won the female title as she crossed the finish line in 1:47.45, besting Alyssa Lagahit's 2:17:00 and Jane Ong's 2:47:30. The 19-under class was ruled by Gavin Solijon who finished in 1:52:23 while Karl Valles finished second in 1:53:43. The Seniors 20 class saw Ralph Francistino Arche claim the crown with a time of 1:44:30 while Kristiane Lim finished second in 1:46:09. Franz Baguio rounded out the top three with 2:47:30. The seniors 30 title on the other hand, was won by Eugene Sanchez who finished with a time of 1:46:09 while Raymund Bontol was the runner-up in 1:47:55. Tenggoy Colmenares won the Masters 40 class while Douglas Sharpe achieved the same feat over in the Masters 50 category. Meanwhile in the super sprint distance, Tyrone Tan won the male open in 59 minutes while Antonio Gocotano placed second with a time of 1:01:42. Mark Almosara finished third in 1:05:26. The female open was won by Rochelle Tan while Loveleingell Casidsid was the runner-up.